The new entry will help commuters to have a direct interchange for both BMTC and KSRTC bus terminal to Metro station. “The six-coach train has a carrying capacity of over 2,000 passengers at a time. We will operate it on the busy East-West Corridor (Baiyappanahalli – Mysuru road),” BMRCL MD Ajay Seth told reporters. He said over 19,000 passe. The six-coach train has a carrying capacity of over 2,000 passengers at a time. 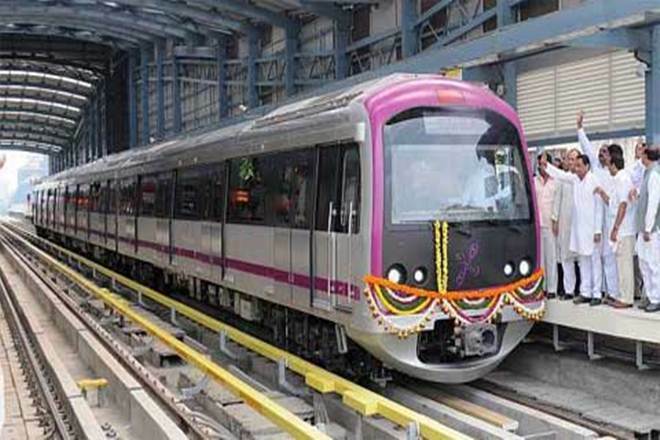 We will operate it on the busy East-West Corridor (Baiyappanahalli – Mysuru road),” BMRCL MD Ajay Seth told reporters. He said over 19,000 passengers use services on the East-West between 9.30am and 10.30am but the North-South Corridor (Nagasandra – Yelechenahalli) records a ridership of only 8,000. The BMRCL, Seth said, would introduce the third set of six-coach trains in October-end. The City received the first six-coach train in June this year. The process of converting all the 53 coach train into six-coach train would take place in the next one year. In March 2017, Bengaluru based BEML Ltd. had won Rs 1,421 crore contract from BMRCL to supply 150 intermediate metro coaches. Officials said about 90,000 commuters interchange from one metro station to the other and about 56,000 commuters either enter or exit at the Kempegowda. metro station in Majestic. “The new entry will help commuters to have a direct interchange for both BMTC and KSRTC bus terminal to Metro station. In all, Majestic metro station has five entry and exit points,” the official release said.